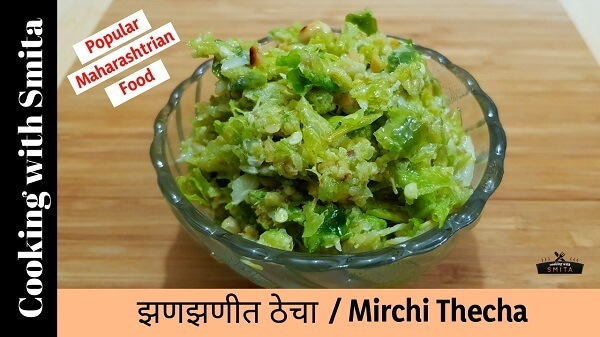 Spicy Chutney known as Green Chilli Thecha known as Hirvi Mirchi cha Thecha is a very popular side dish of Maharashtra. Made from very few and basic ingredients like Green Chillies, Garlic & Peanuts can be an excellent side dish. Also known as Kolhapuri Thecha or Mirchi Kharada goes very well with Bhakari or Roti. It’s also prepared across the states of Rajasthan, Madhya Pradesh and some parts of Karnataka & Andhra Pradesh. 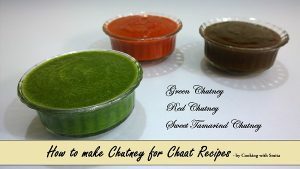 Here’s a step-by-step recipe to make spicy chutney – Thecha. Add Garlic & Green Chillies in hot oil and sauté for 2 minutes. Now add roasted peanuts and sauté for another 1 minute. Switch off the gas and let it cool down for 5 minutes. Once cooled, add salt and mix well. Take the mixture out into a stone-made mortar and pestle and pound it into Thecha. Green Chilli Thecha is ready to serve. You can store it in an airtight container at room temperature for 2 – 3 days. It lasts for 7 – 10 days in the refrigerator. It goes well with Roti or Bhakri, especially Rice Bhakri. If you prefer to eat spicily, use dark green chillies, which are very hot. To make it medium spicy use mix of both, light green and dark green chillies.